Born and raised in China, Sally actually started pursuing the study of US history many years ago in Beijing. Majoring in history at Tsinghua University as an undergraduate, she finished her bachelor thesis on discourses of democracy in Jacksonian era, through analyzing the readership, reception and impact of Alexis de Tocqueville’s 1835 edition of Democracy in America” (UA International Award). She later pursued the study of US history when she went to the MA program of Peking University, and wrote about Thomas Paine’s transatlantic experiences in Britain, France and the United States. That research led her to Robert H. Smith International Center for Jefferson Studies as a resident fellow in the summer of 2017, and now she is finishing up a paper based on the residential fellowship research entitled "Madman and Sage: The Paradox of 'the two Toms’ in the Early Republic”. Sally came to Columbia in 2016. Working as a graduate teaching assistant at Columbia since her second year, she has led weekly discussion sections for Professor Casey Blake’s “US intellectual history” and Professor Elizabeth Blackmar's "the Rise of American Capitalism". While trained as an Americanist, her intellectual interest in China never fades. She is an admirer of Dr. Hu Shi's ambition to remake Chinese civilization, and she kept writing for the Chinese audience, and published reviews, interview pieces and translations of US history in China (Akira Iriye's Transnational and Global History, Sean Wilentz's The Rise of American Democracy). After she moved to Morningside Heights. Her intellectual curiosity towards Chinese intellectuals trained at Columbia and Teachers College in the 1910s further led her to develop her research surrounding the trans-Pacific intellectual exchanges, the rise of "the American Century" and the American “missionary-educational complex” abroad. Currently she is finishing up a paper entitled “Influencing China from Morningside Heights”, in which she discusses how American intellectuals who taught at Columbia and Teachers College (notably John Dewey, Paul Monroe and William Kilpatrick) influenced the May Fourth Movement through a cohort of American-educated Chinese liberal intellectuals, who returned to China after WWI and generated a huge impact upon the May Fourth “new youth”. While analyzing the Sino-American educational and intellectual exchanges in that underpinned the unprecedented Chinese national mania for Woodrow Wilson, she delves into the limitation of cosmopolitan shaped out of intellectual exchanges, in terms of how it is interconnected with orientalism and woven into the fabrics of racism, colonialism and problems of the color line. Sally co-organizes the Cultural and Intellectual History Workshop at the history department, and starts up the initiative "transnational Americanists" with Americanists from Japan, China, Israel, Mexico, etc. 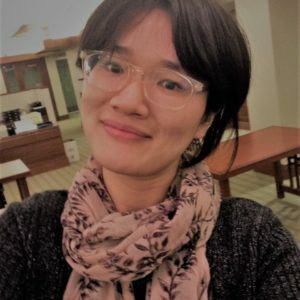 ; she is also a HAPA recipient for her oral interview project “Sino-American Scholarly Online Exchange Project”, which introduces the research of Americanists in the United to the Chinese audience. She is passionate about teaching and will serve as the Lead Teaching Fellow at CTL and the History Department of the academic year 2018-2019. Aside from work, she loves cooking, dreaming of making a movie some day and travelling (with the new ambition to travel across the United States). She would love to talk to prospective students about work and life in Morningside Heights, and please feel free to email her with questions of all sorts.